Photograph of Berlin inhabitants cutting up a horse for meat during fighting in the city, undated. Although Germany signed an armistice with the Allies on 11 November 1918, the trade blockade was maintained - at France's insistence - until the new German republic signed peace terms in Paris at the end of June 1919. This picture was probably taken in January 1919 during the Spartacist uprising, an abortive Communist uprising in Berlin that led to fierce fighting between government troops and revolutionaries. 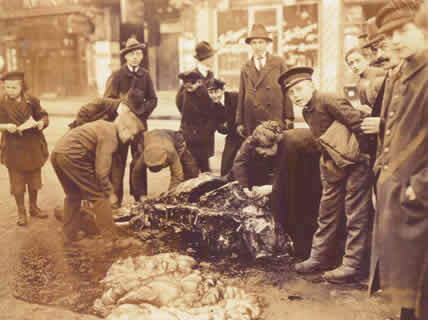 It illustrates starkly the widespread hunger in the city at this time, as women and children hack away pieces of meat from a horse killed in the fighting.